Home » Diet » Top 5 Health Benefits of Seitan! Seitan (pronounced, “say-tan”) is a high protein food, usually made from wheat flour, spelt flour, khorasan wheat or gluten. It’s made by washing flour dough with water until it leaves a sticky mass (gluten) that is then cooked. Seitan or wheat gluten originated in China as an ingredient for noodles in the 6th century. It is very popular in Asia especially in Japan, China and Southeast Asia. It’s also very popular in Asia when catering for Buddhist consumers, who are vegetarian. Interest in seitan has been steadily growing in the West over the last 5 decades, and that trend is positively accelerating right now as an alternative to meat. 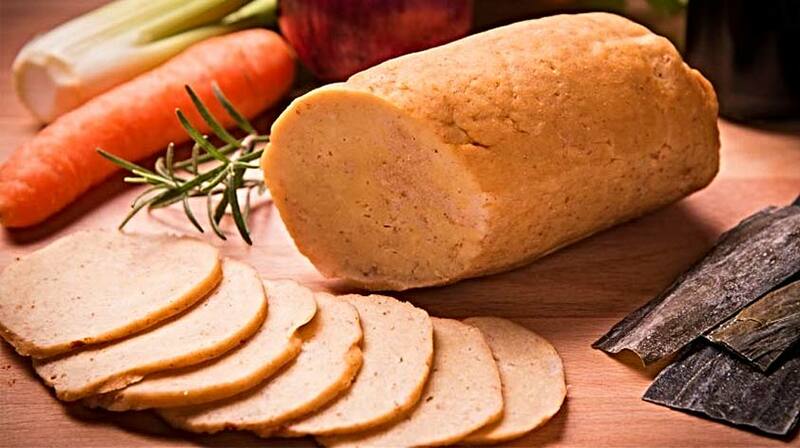 Read on for these Top 5 Health Benefits of Seitan! The first obvious benefit is that it has a high protein (75g per 100g) content making it a good source for vegetarians and vegans. However, bear in mind that since it’s low in lysine, you should ensure you consume lysine-rich foods (such as yogurt, cheese, fruit, beans etc) to meet the recommended needs for good health. Seitan can be useful in keeping cholesterol and triglyceride levels low since it provides proteins without increasing those factors. Seitan is a good alternative not only to meat but also to soya, meaning that it’s proving a highly useful, convenient substitute for people that are allergic to soya or soya-derived products. It’s a good source of iron, selenium and other minerals. Seitan is both easy to digest and assimilate so it can be eaten by people who normally (or are beginning to) find it difficult to digest meat and dairy products.